The mobile phone is much more than a status symbol in your pocket or a handy way to order take-away food. Around the world, it has become a powerful driver of economic growth. AsiaSat supported live transmissions of a heart surgery operation earlier this year in Hong Kong, providing medical practitioners who were attending a conference in Singapore the opportunity to see the procedures and techniques shown by experienced and skilled cardiologists. A dry continent with huge expanses between urban centers is a great environment for radio communications and experimentation—that’s why ever since its early days, regional and outback programs in Australia such as the Royal Flying Doctor Service and School of the Air have relied on HF radio, and more recently satellite communications, to deliver their core services. Piers Cunningham is the Vice President of Maritime Services for Speedcast International. Piers has more than 20 years of experience in the maritime communications sector with previous stints at SatComms Australia and Inmarsat. Based in Australia, he has worldwide responsibility for Speedcast’s Maritime Business Unit. He holds a Bachelor of Science with Honors from the Aldenham School in Hertfordshire, England. In a world where Internet access is coming to be regarded as an essential utility, not having access to broadband connectivity can severely affect the quality of people’s lives. Today, connectivity is an invaluable commodity that has made the world smaller and smarter—people and businesses have immediate access to information, news, data, entertainment, communications and more. Mobile phone service most people take for granted; however, don’t tell that to small town residents of the Australian outback who, until recently, had never been able to use their mobile phones to make a call, check their Facebook account or consult an online map. Delivering Connectivity to the Unconnected. An Integrasys, Optus and VT iDirect Case in Point, by Sivakumar Sandrasegaram, Group Leader, Product Engineering VSAT, Optus Wholesale and Satellite, and Alvaro Sanchez, Sales and Marketing Manager, Integrasys. Today many countries select satellite for their rural connectivity needs, and for good reason. Satellite brings reliable connectivity with widespread availability, high performance, and lower cost. The Comtech EF Data Heights™ Networking Platform (H-DNA) is engineered to elevate business services with unparalleled horsepower, efficiency and intelligence. In large satellite communications Earth stations and teleports with extensive control rooms, there is usually adequate space for the incorporation of RF and microwave Built-In Test Equipment (BITE) such as loop test translators, quality monitoring systems, signal generators, noise generators and spectrum analyzers. Space is the new black... to say that the space industry is growing would be an understatement. According to a new report published by Allied Market Research, “Smallsat Market - Global Opportunity Analysis and Industry Forecast, 2014 - 2022”, the global smallsat market is expected to reach $7,2 billion by 2022. The space environment has changed drastically over recent years, with ever more satellites being launched at an astounding pace. This is, of course, leading to an ever more congested space environment and an increase in close approaches. There can be no doubt that 2016 was a good year for the aviation industry—a record 3.7 billion passengers took to the skies thanks, in part, to 700 new established travel routes as well as a $44 fall in average return fares. There are some extremely confusing messages from equity analysists and researchers as to the overall prospects for the satellite industry in regard to DTH transmissions and how soon those transmissions might be replaced by OTT ‘narrowcasters’. Commercial fishermen the world over face increasing pressures as they strive to make ends meet—whether it’s a family business owner with just a few boats dedicated to harvesting sardines off the coast of Spain, or a fleet that measures worldwide catches of tuna in the millions of tonnes, today’s competitive marketplace makes what’s already a tough job even tougher. 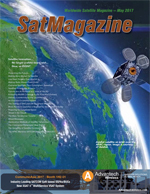 The Asia-Pacific region has always been an important hub for the commercial marine and shipping trade, and a region that NSSLGlobal has built a reputation for excellent satellite connectivity services and customer service.